White Lotus Home is committed to helping the environment: from aiding our local communities, promoting green farming practices nationally, to supporting global green initiatives on a global level. Our focus is to educate the world on the importance living in a healthier home and the benefits these changes bring to our health. We believe that we can make a difference in the bedding industry by setting an example for others. We believe that quality and fair value are more important than low prices and a quick profit. We are opposed to the exploitation of the planet and all its inhabitants. Above all, our people, products, and business practices are socially, politically and environmentally responsible. We wish all homes could be White Lotus Homes! With more people than ever are looking for ways to bring natural, chemical-free products into their homes, White Lotus Home is here to help you create your own non toxic home environment. White Lotus Home has thousands of great stories. Our focus is to educate the world on the importance living in a healthier home and the benefits these changes bring to our health! Know that we are here to help make your healthy Bedroom Dreams become a reality. As a company, we are devoted to taking care of our customers, our employees, and our planet. We are a business with skilled and creative artisans who are committed to their craft, and a sales staff dedicated to exceptional service. We believe that we can make a difference in the green and natural bedding industry by setting an example for others. We believe that quality and fair value are more important than low prices and a quick profit. We are opposed to the exploitation of the planet and all its inhabitants. Above all, our people, products, and business practices are socially, politically and environmentally responsible. We wish all homes could be White Lotus Homes! White Lotus Home has been a leading manufacturer of high-quality natural products since 1981, supplying their handcrafted goods to bedding stores, massage schools, spas, furniture outlets, natural goods stores, and directly to individual customers. Our main showroom and manufacturing facility is located in New Brunswick, New Jersey. Many of our products are available for purchase online and from retail stores across the United States and Canada. All of our products are handmade by skilled artisans in New Jersey, and our production line includes all American raw materials whenever possible. Over the years, White Lotus Home has maintained a simple, two-fold objective: to offer products that are non-threatening to the planet and its inhabitants, and to educate consumers about the benefits of natural bedding.White Lotus Home handcrafts quality products designed to last, and in the process, we aim to cut down on waste during every aspect of our products’ life cycle. Why are we named White Lotus Home? The White Lotus (nelumbo nucifera), a sacred symbol of Indian cultural heritage, sprouts in muddy lakes and ponds, its stalks rising from the murky waters to unfurl magnificent ornamental blossoms that reach for the sun. To White Lotus Home, the flower is an allegory of the human condition’s triumph over chemicals and toxins in the environment as we work to enlighten and inspire others of the benefits of handcrafted natural products, thereby partaking of the White Lotus flower’s endless destiny. NEW BRUNSWICK, NJ – Marlon, owner and president of White Lotus Home, is committed to a sustainable lifestyle and sharing with others the health benefits of living green. Marlon owns and manages White Lotus Home, an industry leader in handcrafted, certified non-toxic mattresses, pillows and other bedding for adults and babies. The company, founded in 1981, is based in New Brunswick, NJ. White Lotus Home also has an extensive wholesale and Internet presence: its goods are offered for sale by as many as 100 web- and brick-and-mortar retailers. White Lotus Home has 13 employees. Marlon joined White Lotus Home as General Manager in 2004 and purchased the company the following year. He has expanded White Lotus’s line of handcrafted products, free of formaldehyde, dyes, fragrances and other chemicals. 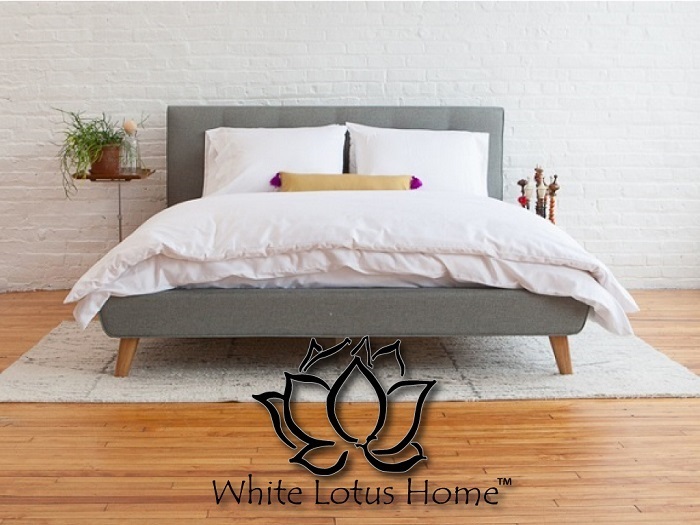 White Lotus Home is dedicated to educating consumers about indoor air quality and toxic chemicals in mattress foams, glues, and fire retardant substances. Marlon was born in the village of Sullana, Peru, where sustainability is a way of life. At age 7, the Pando family moved to Brooklyn, N.Y. His mother and father soon started their own business in handcrafted neckties. As a teenager, Marlon joined the family business. In 1992, the Pando family moved to Miami, where they continued to operate their neckwear business. It was in the family business that Marlon began his manufacturing management career, managing production of the neckties for seven years. Since then, Marlon has amassed more than 20 years of senior management experience in manufacturing, sales and distribution and as a financial advisor. He has worked for several not-for-profit professional trade groups, including the Builders Hardware Manufacturers Association, Window Covering Manufacturing Association, Window Covering Safety Council, Comics Manufacturers Association of America and the Certified Ballast Manufacturers. Marlon graduated in 2001 with a Bachelor’s degree in Business Administration from Metropolitan College of New York, where he also earned his Master’s of Business Administration in 2003. All White Lotus Home products, from our pillows to our mattresses, are crafted from raw, untreated fibers. Many customers notice the raw cotton in particular, whose sweet smell can smell a bit like cooked rice. Depending on the style of your mattress, you may be picking up on the mild scent of our natural latex or virgin wool as well. Because our fibers are minimally processed, they maintain their original odor --- some may notice it, others may not. If left out in the open, the smell should dissipate within a week or two, depending on your sensitivity. Why does my White Lotus Home product have a scent? Many natural fibers and materials have a scent that eventually dissipates. For example, some people may say that Organic Cotton smells like rice or Kapok has an earthy or mossy scent. Why do I smell a scent but my partner does not? Some people may not notice any scent at all and some may be sensitive to new smells. And while most things do have a scent, what is truly important is that the scent is from natural fibers and not from toxic ingredients. What can I do to reduce the natural scent of my White Lotus Home product? If any of our products retain their natural scent we suggest letting the product get fresh air or direct sunlight or if possible, in a room with a ceiling fan and open windows. Most of our pillows and duvets can be put into the dryer on the "Cold Air/ Fluff" setting for 15 to 20 minutes. Is there anything that White Lotus Home can do to minimize the natural scent of the product before it ships to me? For customers that are scent sensitive, we can offer to air your White Lotus Home bedding out for a week or two at no extra cost to you before it ships. This is offered since we have been doing this for over 37 years as we do have some clients that are sensitive to new smells. How can I test the fibers or fabrics that White Lotus Home uses in their products before I make a purchase? We offer free samples of all our fabrics and our fibers that customers can choose on our website by requesting via email or by calling us. Our clients put the fibers in their socks or pillowcases to see if the fiber is a good fit for them. What is the difference between Green Cotton & (PURE) Organic Cotton? I’ve heard that it takes a tremendous amount of pesticides to grow cotton. Is that true? According to the U.S. Department of Agriculture, only about 1.2 pounds of insecticides and 2.1 pounds of herbicides are applied to each acre of cotton. The average acre in the U.S. produces about 800 pounds of cotton. That works out to around 0.09 ounces of total pesticides applied per pound of cotton produced. More importantly, with the advent of new technology, the number of pesticide applications has dropped dramatically in the United States. Farmers who live and work on their land have every personal and economic incentive to use fewer chemicals in production, not more. Globally, only 8.5% of all pesticides applied to crops are used to grow cotton. Even so, are toxins or pesticide reside left on Green Cotton products? In the United States, cotton is regulated as a food crop by the Food and Drug Administration (FDA). Cotton is grown just like other major food crops, meaning that there are tight restrictions on what can and cannot be used as a pesticide. Worldwide studies consistently show no pesticide residue on the raw fiber or the final textile products made from the fiber. Our Green Cotton is power-washed prior to being made into layers of batting and remains our most popular mattress fill. However, if your concern is the pesticides used during the initial growing cycle, you may personally feel more at ease with aCotton mattress whose growth can be certified to USDA Organic standards. What about organic cotton as an alternative? What makes Green Cotton "green"? All of our cotton is grown and aggregated in the United States, and even though it is raised with traditional agriculture methods, all Green Cotton is pre-rinsed before it arrives at our location. We call this cotton “green” because no dyes, perfumes, formaldehyde, or fire retardants added to the batting after it is harvested. Our Green Cotton also prevents waste, as the fiber itself too short or course to be made into threads for textiles, and is often discarded. However, it is perfectly suited for garnering into layers for mattresses and toppers, gathered for pillow stuffing, or for bulk sale. Green Cotton is slightly firmer than organic cotton due to the thicker threads, but there is plenty to feel good about! Where do your fibers come from? Our organic cotton comes from Texas, our green cotton comes from Texas and other surrounding US farms, our organic buckwheat comes from NY state, our wool comes from the west coast and only America, our eco-foam, and natural latex is made in the USA as well. The kapok is the only fiber that does not grow in the USA since it grows in the rainforest, so we get ours from Malaysia. We certainly find our mattresses comfortable! All White Lotus Home staff (and often their families!) sleep on White Lotus mattress, and we believe that everyone in the world should be so lucky. Our natural mattresses offer the support your doctor recommends and the comfort level you desire. Whether you intend to use your mattress as your primary sleeping surface or as a futon couch, our Bedding Professionals will help you find a mattress and topper combination that meets your specific needs. We understand that bedding is a truly subjective issue, and what you like to sleep on is a personal choice. 1 (very soft): The softest mattress set up that White Lotus Home handcrafts. White Lotus Home and most back doctors do not recommend very soft mattresses but, if this is what you are comfortable with we recommend adding a Wool Topper EXTRA on top of an All Natural Latex Mattress and a Natural Latex Topper. This 3 piece set should feel like you are on a cloud! If this trio ever becomes too soft, you could always remove a layer or two. What is the lifespan of a White Lotus Home mattress? Do note that these only represent an average expectancy. Many customers find that their handcrafted mattresses long exceed those averages --- the longest on record was a customer whose mattress was over 30 years old! Cotton as a raw fiber tends to compress slowly over time, and if you prefer a firm sleep surface, you may find that your mattress ages better. Mattresses with an inner core will be a little more resilient and tend to wear a more evenly. By adding a core of Latex or Foam, the natural compression process is slowed. For this reason, the lifespan of a Foam Core or Latex Core mattress tends to exceed that of an all-cotton mattress. Our All-Latex Mattress is the most durable, as the raw material itself does not begin to break down for at least 15 years. As it is a solid block of natural latex foam, it will not compress and should maintain its shape over time. Are your mattresses standard sizes? All of our mattresses are standard, conventional sizes, and we also offer custom work. Please see our chart listing the exact dimensions and weights of Standard Mattress Sizes. Do bear in mind that our mattresses are handmade, and a variation of up to 1” is appropriate. Each King-sized White Lotus Mattress measures 76x80", which is generally considered the standard dimensions. However, certain furniture manufacturers may offer King frames that necessitate a 78x80" or even an 80x80" mattress. we recommend measuring your bed frame prior to finalizing a mattress order White Lotus Home to ensure the perfect fit. Should you require an alternate size, please email us or call at (732) 828-2111 to proceed with a custom order. How thick are your mattresses? Our standard mattresses that are filled with 100% Organic Cotton or Green Cotton are 6” deep corners and feature handles on two sides for ease of flipping. They are also available as a 5" Futon Mattress, which feature rounded corners and do not include handles. Our standard cotton mattresses are hand-stuffed with 8-10 layers of cotton batting, of which each layer begins about 2” thick. The cotton is then compressed cotton into the case before our Mattress Artisans tuft each piece by hand ---- a labor-intensive process that creates an even, long-lasting cotton mattress for our customers. As cotton is a soft and giving fiber, and accurate measurement of height is challenging, as the loft of the cotton creates a lofty surface. Our cases are crafted up to 2" smaller than the intended depth, as that allows approximately 1" on either side for the loft of the cotton. Please bear in mind that our mattresses are handmade, and a variation of up to 1” is appropriate. All styles of cotton mattresses can be crafted as in 7" or 8" varieties. Though most customers find a standard 6" mattress to be sufficient, we do offer mattresses as thick as 8" for those who prefer a deeper mattress or whose bed frames require it. One notable exception: we do not recommend Boulder mattresses any deeper than 7". Our Pure Cotton or Green Cotton Boulder Dreamton is crafted with 15% more cotton and twice as many tufts as our classic Dreamton and is meant for those who enjoy an extremely firm sleep surface. It becomes increasingly difficult to tuft an 8" surface, and the tufts are an essential component of a Boulder, as they pull the fibers closer together. In adding extra inches to a Boulder mattress, you may negate the firmness that characterizes our Boulder style. Our All-Latex mattresses are approximately 7” thick and are offered with an optional 3” topper. Our frame is King-sized, but I do not want a mattress upwards of 140 pounds. Do you offer a Split King? Our mattresses are crafted by hand by compressing 8-10 layers of cotton, each beginning at about 2” in thickness. This results in a thick, sturdy mattress of superior quality --- but it also means that a king mattress can run upwards of over 140 pounds. Many customers enjoy the luxury of a King mattress but are looking for something easier to move, as routine flipping is necessary for proper care and cleaning. For the ease of our customers, we offer the option of a Split King. Two XL Twin mattresses can be placed side-by-side to create a King mattress surface. The exact dimensions depend on the type of king bed frame you have. Do bear in mind that are mattresses are malleable and will mold to accommodate most frame. Another option would be to purchase two King Stowaway Mattresses, each of which is 3 inches in depth; they are also available in 4” thickness for an additional charge. The stow would allow you to easily move your mattresses more while providing a solid sleep surface. One stow could also be removed to use as a guest mattress if necessary. Whether combining two XL Twin mattresses or two King Stowaways to create your Split King Mattresses, these sizes are considered standard and would therefore NOT incur a 15% Customization Fee. We can also create a Split Queen Mattress. However, as the two individual 30x80" pieces do not correspond with any standard sizes, the creation of a Split Queen would require a 15% Customization Fee. For more information on custom pieces, please contact us by email or by phone at (732) 828-2111 and our Bedding Professionals will help you create a sleep surface that meets your specific needs. What is the benefit of adding a Latex Core or an Evergreen Foam Core to a mattress? Adding an inner core of either natural latex or Evergreen Foam offers two benefits: a more defined shape when used on a bi-fold frame, a longer lifespan, and a softer overall feel. Despite what most people think, the difference between these two mattresses is NOT a quality issue, but rather a usage issue. If you are planning to use your mattress as a couch on a bi-fold frame, the inner core helps the mattress to keep its shape, maintaining a straight line across the back. An all-cotton mattress, by contrast, may be a better fit if you intend to use your mattress on an "A-Frame" or a "tri-fold" frame. If you will be using your mattress as a bed only, the primary concern becomes comfort and feel. A Foam Core mattress is slightly softer than an all-cotton mattress, as the foam breaks up the firmer layers of cotton. Our Latex-Core Dreamton is the softest of our cotton mattresses, as the latex provides a soft, giving core within the density of the cotton. All-cotton mattresses tend to be firmer, as they are comprised solely from heavy layers of raw cotton. Mattresses with an inner core will be a little more resilient and tend to wear a more evenly. As a fiber, cotton will compress slowly over time, creating a firmer sleep surface. By adding a core of Latex or Foam, the natural compression process is slowed. For this reason, the lifespan of a Foam Core or Latex Core mattress averages about 12-15 years, whereas an all-cotton mattress has an expected lifespan of 08-10 years. Why are hand-made mattresses better than machine-made mattresses? Everything you purchase from White Lotus Home is crafted with the finest materials. Each piece is handmade one at a time to ensure the quality that you demand and the uniqueness that our customers have come to value since 1981. Our Dreamton mattress is as natural as Mother Earth intended. Whether you choose Organic Cotton or Green Cotton, each mattress is crafted by hand from raw, unprocessed fibers without added dyes, perfumes, formaldehyde, or other chemicals. Can your conventional mattress say that? Many factory-made mattresses are created with a machine that simply blows cotton into a case instead of layering ---- often times, you are buying is a large cover of air with some cotton. After a few weeks, the air will seep out and your pricey mattress and you'll be left with something more closely resembling a resembling pancake. Not so comfy! Our Mattress Artisans layer and compress sheets of cotton batting before hand-tufting the final piece. Your White Lotus Home Dreamton mattress will contain only raw cotton, virgin lambswool from California, an optional core of either Evergreen Foam or Natural Latex, and an exterior case of either 100% Cotton or Organic Cotton Twill. Conventional mattresses are often quilted with thick punctures through the cotton, which tends to break up the batting. Our mattresses are layered - one sheet at a time - before hand-quilting the surface with a sharp needle that ensures the inner cotton will not break, shift, or lump. What does "FR" stand for? "FR" is an acronym for Flame Retardant. Federal Regulation 1633 requires that manufacturers must treat mattresses with a flame retardant or to obtain a doctor's prescription as an exemption. We primarily utilize virgin wool as a natural flame retardant --- our line of Dreamton, All-Latex and Evergreen Foam mattresses feature a thin wrap of American-grown wool around the inner fibers. No added chemicals are necessary, and you have the peace of mind your natural, untreated mattress passes the flame retardant test. For those who are looking for a vegan option or a lower price point, we can utilize Borate Powder on Green Cotton mattresses as a flame retardant, often notated as "FR". This option is not available for mattrresses filled with Organic Cotton. We manufacture a limited number of mattresses with borate powder, all of which are processed in a separate manufacturing area to prevent cross-contamination. About Boric Powder: Cotton treated with boric powder assist in passing the Federal Flammability Laws. A study done by Intertox, Inc. of Seattle, WA, presents conclusive proof that boric acid, under the specific trade name Boron#10(TM), which is sodium polyborate, is not toxic. The report states, "Four of the six studies reviewed indicate no observed adverse health effects from exposure of the test animals to the Boron#10 added to cotton batting." Richard Pleus, the author of the report also stated that in an oral toxicity study a benchmark toxicity measure, LD50, for the product Boron#10 was successfully established. The LD50, defined as the dose of a compound that would be lethal for 50% of a group of test animals, was extrapolated to be 3,339 mg/kg, a number similar to the toxicity of table salt. This report, A Review of General Acute Toxicity Studies of Boron#10 in Cotton-Based Batting Product, is available by sending a letter of request and a 9" x 12" SASE to: Mr. Jim Blasius, Incide Technologies, Inc., 50 N 41st Avenue, Phoenix, AZ 85009. What are your Dreamton mattresses treated with? Our Dreamton mattress is as natural as Mother Earth intended. Whether you choose Organic Cotton or Green Cotton, each mattress is crafted by hand from raw, unprocessed fibers without added dyes, perfumes, formaldehyde, or other chemicals. Our Mattress Artisans layer and compress sheets of cotton batting before hand-tufting the final piece. Your White Lotus Home Dreamton mattress will contain only raw cotton, virgin lambswool from California, an optional core of either Evergreen Foam or Natural Latex, and an exterior case of either 100% Cotton or Organic Cotton Twill. As many of our customers experience chemical sensitivities, no added chemicals, dyes, or fragrances are added at any point in our production to either the interior fill or exterior case. We take our customer's medical needs very seriously and would never purposefully add undisclosed ingredients to our products. We manufacture a limited number of mattresses with borate powder flame retardant --- this allows us to provide a vegan option at a lower price point for individuals who are unable to provide a doctor's prescription or would like the peace of mind of a mattress that fulfills the requirement of Federal Regulation 1633, which mandates the use of flame retardants in mattresses. However, all borate mattresses are processed in a separate manufacturing area to prevent cross-contamination. Do you do offer custom work? Can you make a piece to my specifications? If you are interested in a custom piece, unique project, or modified version of a standard White Lotus Home product, we encourage you to email us or call (732) 828-2111 with your specifications. What are my options for flame retardants? Do I need a doctor's note? What are my options for flame retardants? Do I need a doctor's note for chemical-free mattresses? Federal Regulation 1633, effective as of July, 1, 2007, requires all mattress manufacturers use a flame retardant (FR) to pass these laws. This latest FR law help increase escape time for victims trapped in a fire which should save hundreds of lives. If you find others claiming that they make 100% organic or 100% natural mattresses without the use of a flame retardant, please request details of how they are meeting the FR1633 law. Our Dreamton mattresses, which contain no added chemicals, are wrapped with wool and fulfill all federal requirements for flame retardants. A doctor's prescription can be provided as an exemption, allowing you to purchase all-cotton mattresses without wool or borate powder. The note must be on a formal prescription block or official doctor's letterhead with DEA number and should read to the effect of: "My patient requires a chemical-free mattress". For legal reasons, we cannot accept notes from practitioners who cannot dispense medication, which includes a number of chiropractors, acupuncturists, and naturopaths. You are welcome to purchase a mattress without wool or other flame retardants before obtaining a formal prescription. We will place the item on hold: you will maintain your place in our Production Queue, preventing any delays with your order, but we are unable to craft the mattress until an acceptable prescription is received. Again, our Dreamton mattresses utilize wool as a natural flame retardant without the need for added chemicals. Alternatively, we can utilize Borate Powder on Green Cotton mattresses as a flame retardant. This option is not available for mattresses containing Organic Cotton. We manufacture a limited number of mattresses with flame retardant --- this allows us to provide a vegan option at a lower price point for individuals who are unable to provide a doctor's prescription. However, all borate mattresses are processed in a separate manufacturing area to prevent cross-contamination. After purchase, please fax, email, or mail a copy of your prescription in a timely manner, so that we can begin handcrafting your mattress. Want to skip the prescription? Check out our line of Dreamton mattresses, which include a layer of luxurious wool that acts as a natural flame retardant! No prescriptions needed, and no flame retardants. Did my handcrafted mattress shrink or shift? Did my handcrafted mattress shrink or shift? Is this the size I ordered? Don't worry: your mattress did not shrink! All mattresses are shipped rolled, and the air is vacuumed out of your mattress prior to shipment, which allows the item to fit in standard packaging. By using standard packing, your shipping costs stay low, and you receive your products in the fastest means possible! The packaging is also more manageable when reduced in size. While the vacuuming process assists with shipping, this may cause the mattress to contract. Sometimes, it appears as though the mattress has shrunk. Other times, the surface may appear uneven. As each handcrafted mattress is unique, this temporary compression may occur in some mattress, but not others, even within the same order. You can counteract this by manually adjusting the mattress --- pounding the top, lifting the mattress a few inches in the air and allowing it to gently fall into the frame. Beating and pounding the cotton mattress will correct the shrinkage we sometimes see during delivery, expanding the cotton layers and bringing loft and life back into the fibers. Almost all of the time, the mattress should meet the intended dimensions. Please bear in mind that our mattresses are handmade, and a variation of up to 1” is appropriate. Rest assured --- you’re just minutes away from a healthy night’s sleep! What is OPTIMUS FREE SERVICE? OPTIMUS Service means we are offering FREE RUSH Manufacturing SERVICES. Your order will ship out promptly. Mattresses in 1-2 weeks, Bedding and Pillows in 3-5 business days! Please refer to our Shipping Policy for any questions regarding shipping or White Glove Deliveries. Please contact us by email to request expedited services, or call 732-828-2111. Please note that Rush Service is dependent on factors such as current order volume and the availability of our raw fibers and is offered at our discretion. Do you offer Expedited Services? Rush service is typically available on products manufactured by White Lotus Home for an extra fee of either 25% of the item with a maximum of $100.00 per item. With a paid Rush Fee, production time can be reduced by half. Mattresses, for example, are crafted within 3-5 weeks and a paid "rush" fee truncates that time to 1-2 weeks. Deliveries are usually scheduled the week following the product's completion, while items shipped via FedEx will be sent on the next business day. Please refer to our Shipping Policy for any questions regarding shipping or White Glove Deliveries. We accept all major forms of payment including cash, checks, Visa, Mastercard, American Express, Discover, and PayPal. When placing orders by phone or in our New Jersey showroom, all credit cards are processed through PayPal, the same way you would normally swipe at a terminal. While the transaction does not go through a PayPal account you have personally, you may see it reflected as a PayPal transaction on your credit card statement. All cash purchases should be made in our showroom for your protection. To place an order by check, please contact us by email or by phone with the products you intend to order, at which time we will forward a digital copy of your invoice. Upon receipt of the check, we will send you a confirmation and remove your order from hold. Bounced checks will automatically incur a $50 Service Fee, and your order will be placed on hold until a successful payment is made. We offer 5% off all order placed by cash or check. While this additional discount can often be combined with other sales or offers, do note that it is extended at our discretion. Please refer to the fine print of the promotion for further details. For those interested in Financing: Enjoy No Payments and No Interest if paid in full in 6 months on PayPal Credit purchases of $99 or more. Simply choose PayPal Credit when you check out with Paypal. Payment Plans, or Layaway, please contact us for more information. We are also open to bartering. Tell us what you would like to barter and we will get back to you shortly. We are always looking for different ways to increase our marketing, PR and our direct audience. We can be reached by email or by phone at (732) 828-2111. No need to wait to pick out your organic mattress, pillow, or bedding etc...You can choose now and pay little by little. At whitelotushome.com we offer Lay-Away plans, financing and accept barters. Send your questions and request about this to info@whitelotushome.com. Send us your complete contact information, including address, email and #. We prefer to have a credit card on file and arrange automatic payments. We will charge your card on the same day (you choose) of every month. Once you have made 2/3 of your total (you can choose to pay more at any time), your order will go into production and it should be ready to ship before we charge your last payment. Depending on the time of year and size of the order, these numbers can vary by up to one week. For custom orders, an additional week of production time is typical, as unique pieces often require particular care and attention. Please allow 2-5 business days for shipping from our New Jersey manufacturing facility to your location. When the shipment is processed, you will receive automated tracking information from the shipping carrier servicing your order. Any furniture orders outside of our 100-mile delivery range will ship directly from the manufacturer. We also offer Free Delivery & White Glove Service on qualifying orders. Rush service is typically available on products manufactured by White Lotus Home. Production time can be reduced by half for a Rush Fee of 25% of the item with a maximum of $100.00 per item. Please contact us at info@whitelotushome.com if you would like to request expedited services or call 732-828-2111. Do you offer a printed catalogue of your products? Our printed catalogues have been discontinued in an effort to save trees. The vast majority of our products are available for viewing on our website. If you would like to know more about a specific product, we would be happy to send additional information via email or by mail. Please call us at 732-828-2111 or send such requests to sales@whitelotushome.com and be sure to include your full name and address. Mattresses and pillows should not remain damp, as it may contribute to uneven wear or mold growth. Following a spill or cleaning, dry any moisture by placing the mattress in the sun or by using a hair dryer. Ensure the mattress is fully dry before re-adding a mattress pad or protective cover, such as our Barrier Cloth Covers. If you are within 150 miles from our NJ facility, located at 745 Joyce Kilmer Avenue, Ste E New Brunswick, NJ 08901, we can visit and help flip your mattress at no cost you. We suggest doing this every change of season! As long as we are in your area doing other free deliveries, we would be more than happy to flip your mattress for you, for Free. We could also bring samples of other products you may be interested in testing. To set this up, email your request to info@whitelotushome.com or call us at 732-828-2111. Bedding should not remain damp, as it may encourage uneven wear or mold growth. Following a spill or cleaning, dry any moisture by placing the item in the sun or by using a hair dryer. Ensure it is fully dry before re-adding sheets or protective covers, such as our Barrier Cloth Covers. All Coyuchi mattress pads are machine washable. We recommend machine washing on the gentle or delicate cycle with like colors, with cold water and a natural, plant based laundry detergent. We do not recommend using whiteners, as bleaching agents may diminish the brilliance and depth of the colors; when needed, use only non-chlorine bleach. Line dry, or tumble dry low and remove promptly. Fabric softeners and dryer sheets reduce the absorbency of cotton textiles and are not recommended. Place a set of wool dryer balls inside the dryer to naturally soften the fabric and reduce drying time. Use a warm iron as needed. 39 x 75 x 7"
39 x 75 x 8"
39 x 80 x 5"
39 x 80 x 7"
39 x 80 x 8"
54 x 75 x 5"
54 x 75 x 7"
54 x 75 x 8"
60 x 80 x 6"
60 x 80 x 5"
60 x 80 x 7"
60 x 80 x 8"
76 x 80 x 5"
76 x 80 x 7"
76 x 80 x 8"
28 x 54 x 6"
60 x 80 x 1.5"
30 x 75 x 3"
39 x 75 x 3"
54 x 75 x 3"
60 x 80 x 3"
76 x 80 x 3"
As all White Lotus Home products are unique, all dimensions and weights are approximate and may vary +/- 1 inch or pound. Toddler ∙ 28 x 54 x 2" ∙ 10 lbs. Twin ∙ 39 x 75 x 2" ∙ 14 lbs. XL Twin ∙ 39 x 80 x 2" ∙ 15 lbs. Double/Full ∙ 54 x 75 x 2" ∙ 19 lbs. Queen ∙ 60 x 80 x 2" ∙ 20 lbs. King ∙ 76 x 80 x 2" ∙ 20 lbs. Toddler Extra ∙ 28 x 54 x 4" ∙ 20 lbs. Twin Extra ∙ 39 x 75 x 4" ∙ 28 lbs. XL Twin Extra ∙ 39 x 80 x 4" ∙ 30 lbs. Double/Full Extra ∙ 54 x 75 x 4" ∙ 38 lbs. Queen Extra ∙ 60 x 80 x 4" ∙ 39 lbs. King Extra ∙ 76 x 80 x 4" ∙ 40 lbs. Twin ∙ 39 x 75 x 2" ∙ 15 lbs. XL Twin ∙ 39 x 80 x 2" ∙ 16 lbs. Double/Full ∙ 54 x 75 x 2" ∙ 20 lbs. Queen ∙ 60 x 80 x 2" ∙ 21 lbs. King ∙ 76 x 80 x 2" ∙ 22 lbs. Cali King ∙ 72 x 84 x 2" ∙ 22 lbs. Twin Extra ∙ 39 x 75 x 4" ∙ 30 lbs. XL Twin Extra ∙ 39 x 80 x 4" ∙ 32 lbs. Double/Full Extra ∙ 54 x 75 x 4" ∙ 40 lbs. Queen Extra ∙ 60 x 80 x 4" ∙ 42 lbs. King Extra ∙ 76 x 80 x 4" ∙ 44 lbs. Cali K Extra ∙ 72 x 84 x 4" ∙ 44 lbs. Toddler ∙ 28 x 54 x 2" ∙ 16 lbs. Twin ∙ 39 x 75 x 2" ∙ 21 lbs. XL Twin ∙ 39 x 80 x 2" ∙ 23 lbs. Double/Full ∙ 54 x 75 x 2" ∙ 25 lbs. Queen ∙ 60 x 80 x 2" ∙ 26 lbs. King ∙ 76 x 80 x 2" ∙ 26 lbs. Toddler Extra ∙ 28 x 54 x 4" ∙ 27 lbs. Twin Extra ∙ 39 x 75 x 4" ∙ 35 lbs. XL Twin Extra ∙ 39 x 80 x 4" ∙ 37 lbs. Double/Full Extra ∙ 54 x 75 x 4" ∙ 45 lbs. Queen Extra ∙ 60 x 80 x 4" ∙ 47 lbs. King Extra ∙ 76 x 80 x 4" ∙ 47 lbs. Toddler ∙ 28 x 54 x 3" ∙ 15-20 lbs. Twin ∙ 39 x 75 x 3" ∙ 19-22 lbs. XL Twin ∙ 39 x 80 x 3" ∙ 24-27 lbs. Double/Full ∙ 54 x 75 x 3" ∙ 25-30 lbs. Queen ∙ 60 x 80 x 3" ∙ 35-40 lbs. King ∙ 76 x 80 x 3" ∙ 45-50 lbs. Cali King ∙ 72 x 84 x 3" ∙ 45-50 lbs. ∙ Medium ∙ 20 x 20"
∙ Medium ∙ 24 x 24"
∙ Medium ∙ 21 x 8"
Most orders are shipped via FedEx or UPS. When the items leave our facility, you will receive automated tracking information via FedEx or UPS. If you do not receive this information, please do not hesitate to email us and our staff can provide a tracking number. Can White Lotus Home recycle my mattress? Can I donate my mattress? If you are looking to donate your mattress, we recommend seeking out local charitable organizations or homeless shelters, Craigslist, or Freecycle. Do note that, for sanitary reasons, certain non-profts may not be able to accept used bedding. You might also find some success in contacting a wildlife reservation, as they might find a use for the raw cotton and other fibers for nests for their animals. Because our bedding is crafted from all-natural materials, they are biodegradable. For orders delivered within the range of our White Glove Service, our Mattress Removal Service includes movement of your existing mattress for disposal on premises in a designated area, such as the curb or garbage. For sanitary reasons, we cannot take your unwanted mattress or furniture into our van, as this may compromise the integrity of our other natural and organic products. There is an additional $35 fee for the removal of your existing mattress, which must be paid prior to the delivery. Do your furnishings come with assembly instructions? Can you help assemble or repair my piece? All furnishings ordered online from White Lotus Home will be shipped directly from the manufacturer and should contain assembly instructions. Any orders delivered with our complimentary White Glove Service includes free assembly of your bed frame, futon, or other furniture. Do note that any piece purchased as a floor model may or may not include written assembly instructions, as the piece was already assembled on our showroom floor. Assembly instructions for bi-fold futon frames manufactured by the BedWorks of Maine can be found here. If you require assembly instructions from a previous purchase, kindly contact us by phone or email and we will be happy to assist you. For faster service, please have the model, manufacturer, and finish information available. We also welcome pictures of any issue you are experiencing, as a visual reference will help us to provide you with the most accurate information. We also offer house calls within a 150-mile radius of our showroom in New Brunswick, NJ, with limited availability for repairs in South Florida. White Lotus Home professionals can perform an on-site assessment, offer solutions, and fix or correct the problem. Our fee is $35 for the first hour and $25 for each addition hour with a 1-hour minimum. We generally request pictures prior to a house call, as that allows us to adequately prepare and provide the most effective service. All repairs are performed at our discretion. Contact us for more information or to request a house call. White Lotus Home is proud to offer FREE DELIVERY and WHITE GLOVE SERVICE for qualifying mattress orders. How do we schedule a delivery time? Upon completion of your order, our Delivery Department will reach out to you via email with a tentative delivery date and two-hour time window. Typically, appointment windows are scheduled with at least 3 day's notice. All of our deliveries are grouped by geographic area, which allows us to accomplish the greatest number of deliveries in the least amount of time with the smallest ecological footprint. As a courtesy, we will call 30 minutes prior to arrival. What is included in your White Glove Service? Our White Glove Service includes delivery of your mattress, topper, furniture, or and soft goods. We will unroll and lay your mattress on the frame, remove and dispose of packaging, and make manual adjustments to the mattress if needed. If your purchase includes furniture, we assemble your frame; if you purchased a cover for your mattress, we will add it as well. There is an additional $35 fee for the removal of your existing mattress, as this service requires the movement of your items in your home. Our Mattress Removal Service must be paid prior to the delivery and includes movement of your existing mattress for disposal on premises in designated area, such as the curb or garbage facility, or movement to another area of the home, such as a basement or garage. For sanitary reasons, we cannot take your unwanted mattress or furniture into our van, as this may compromise the integrity of our other natural and organic products. Please note that all deliveries are accomplished at our discretion. Qualification for delivery is dependent upon the order size, distance from our manufacturing facility, availability of our driver, and other area deliveries, among other considerations. We group our deliveries by geographical area for maximum efficiency and lowest environmental impact. As a courtesy, we try to call 30 minutes prior to arrival. If we experience any delay due to inclement weather, traffic, or other circumstances, our driver will be in contact with you. If there is any cancellation of a scheduled delivery, we would appreciate one-day advance. We can always leave purchases with a doorman or on a covered porch area upon your written request. How do I select a pillow fiber that works for me? Our Kapok pillows are our number-one best-seller! Due to the luxurious feel of the fiber, these universally beloved pillows work well for a wide range of individuals, from those who prefer something soft and giving to those who need some support from their sleep surface. Kapok is a vegan, sustainable fiber from the ceiba tree that offers a similar feel to down. Unlike feathers and down, however, Kapok has many hypoallergenic properties and ethically sourced. In our experience, many individuals with chemical sensitivities, as well as those with physical challenges, do well with Kapok pillows. Our Pure Cotton and Green Cotton pillows offer a dense, even surface. Cotton pillows are breathable and work well for those who prefer a firm-yet-supportive feel. Our Wool Pillows are wonderful for those who want an even surface like cotton but the fluffiness of kapok. Those with allergies are quick to pick wool, as the fiber itself is naturally dust-mite resistant. Our pure, virgin wool is soft, resilient, and naturally regulates body temperature. Do note that due to the nature of the fiber, wool may compress with time. Therefore, we strongly encourage our customers to add a zipper to their wool pillow, as this can extend the lifespan of the product. Our Buckwheat and Buckwool pillows utilize the three-cornered hull of the buckwheat seed in a pillow that is firm yet supportive. The hulls allows air to flow through the pillow, keeping your head cool and dry. The beanbag-like fill contours to the head and neck, providing excellent support. While certainly a different "feel" from conventionally fluffy pillows, many of our customers with neck and back issues have found success with our Buckwheat and Buckwool pillows! Our Shredded Latex pillows are temperature-neutral, dust mite resistant, and naturally antimicrobial. Our natural Dunlop latex provides ample neck and head support without causing overheating. Unlike many other fibers, the latex holds its shape for many years without harboring allergens. All of our pillows can be crafted with an optional zipper, which allows you to add or remove the inner fill and reach your preferred comfort level. Our Kapok, Organic Cotton, Green Cotton, and Wool pillows are all offered in Soft, Medium, and Firm densities, while our Buckwheat, Buckwool, Shredded Latex, and Shredded Foam are a standard Medium fill. Need help finding your perfect match? Contact us by phone or email! Our Bedding Professionals can assist you in finding a pillow that meets your needs. Why should I add a zipper to my pillow - what is the benefit? For your comfort, we offer our pillows in three different levels of density: Soft, Medium, and Firm. A "Medium" pillow fill is generally the most popular and consists of an "average" amount of inner fibers. The "Soft" contains less fill than the standard, while the "Firm" contains additional fibers for the highest density. All of our pillows are offered with or without a zipper. If you are unsure of which firmness to purchase, we recommend you select pillow with a zipper. The zipper allows you to adjust the inner fibers to reach your own personal comfort level, as you can add or remove filling to your liking. Many pillows, such as cotton and wool, may compress over time: purchasing a pillow with a zipper allows you to add fibers back over time to maintain your preferred level of comfort. Others, such as kapok, may absorb the healthy oils from your face and hair, and may benefit from the occasional manual readjustment. We also sell our fibers in various weights so you can keep your pillows at the right firmness for years to come. For fiber storage, choose a cool, dry location; we recommend recycling the bag in which you received your pillows. Adding a zipper also makes your pillow greener! How? You can remove the filling, wash the case, and re-stuff with fresh filling. You can remove stains and refresh the case while reducing the water you would use washing a standard pillow. This is a great way to extend the lifespan of your pillow case without the need to replace it entirely. (Please note that our care instructions specify that our pillows are spot clean only and should never be fully submerged in water, as it may damage the raw fibers within --- only the exterior case is washable). Some of our customers have kept their White Lotus Home mattresses for over 30 years! If anything you purchase from White Lotus Home fails to live up to your every expectation, we want to know immediately.You have 120 days to return or exchange your mattress and other White Lotus Home products purchased under our 120-Night Return Policy. If any item becomes limited in its use due to normal wear and tear, White Lotus Home will make every effort, for as long as you own the item, to repair or replace it at our discretion. Depending on the item, the length of time used, and any signs of negligence or misuse, there may be a charge for this service. This is a personal promise from a company who values its reputation for fairness and ethics in business. Proper care instructions are provided with every White Lotus Home mattress. Please note that improper care or use of your White Lotus Home product may invalidate this warranty. Proper care is essential for the longevity and comfort of a mattress, as it is for most quality pieces. With time and use, a mattress will become firmer and the cotton and wool may settle according to the size, shape and sleeping patterns of the user. This is a normal occurrence and in no way reflects a manufacturing defect or a compromise of our warranty. Still have questions about proper care for your White Lotus Home mattress? Contact us so we can assist you. Any and all warranty claims must be accompanied by the original sales receipt, whether the item was crafted by White Lotus Home. The product must be sent or brought to a White Lotus Home factory for examination. The warranty cannot be transferred to any other party. It may be returned by shipping or delivery service. The purchaser will be responsible for proper packaging and insurance. White Lotus Home will reimburse shipping expenses for valid warranty claims within 30 days of receipt of goods. A copy of the original sales receipt must accompany the item and White Lotus must be notified prior to shipment. *Rule Exceptions: If the original purchaser is a minor, aged, or infirm, a proxy may conduct all business on behalf of the purchaser. A note from the purchaser to this effect would be appreciated. The validity of all claims will be at the sole discretion of White Lotus Home. Each outside furnishing company with whom we deal has their own warranties for their frames and furniture, ranging from 1 year to lifetime coverage. During the warranty period of these pieces, we will act as agent for the woodworker and assist them in fulfilling the obligations they have made to you, the consumer. It is our duty to adhere to the guidelines they have set forth for their own warranties, including, but not limited to, the woodworker's option to repair or replace items at their discretion, as well as any limitations due to negligence or misuse of the item. Please note that if a previous third-party vendor has gone out of business or ceased wholesale operations, we cannot be liable for upholding a warranty. Above all, we promise that any purchase you make from White Lotus Home is a quality product that we have offered to you at a fair price, and we have made every effort to assure that you will enjoy your purchase for as long as you own it. Everything you purchase from White Lotus Home is crafted with the finest hardwoods, fibers, and fabrics so that we can offer you superior finished goods. Everything that we make ourselves, from pillows to mattresses, has been crafted with the utmost care, and each piece is handmade one at a time to ensure the quality you demand and the uniqueness our customers have come to value since 1981. All materials we do not make ourselves are carefully scrutinized and need to meet the standards that we hold for our own handcrafted products before we consider offering it for sale. We take great pride in our work and value your trust in us and our shared commitment to our Earth above all else. We are always eager to hear about your experiences, so please call or write us at any time with comments, criticisms, or questions! Can I modify my open order with White Lotus Home? Most orders may be adjusted or modified the same day the order is placed. An upgrade of materials may incur an additional charge. Beyond the 24-period, you will be charged a fee that is 30% of your order total to make any modifications that result in a downgrade of materials. Any items added to an order the day after it is placed will be accepted as a new order. How do I cancel my order with White Lotus Home? All orders may be cancelled prior to shipment, at which time we will issue a credit of the full purchase price. Your store credit will be valid for one year following the original purchase date and cannot be combined with any other coupons or promotions. Should you prefer a refund, we offer penalty-free cancellations within 1 day of ordering. Cancellations beyond that time will incur a 30% Restocking Fee. What items are eligible for Returns & Exchanges? White Lotus Home has the option to refuse any return or exchange. Unused bedding can be exchanged in its original condition within 30 days of purchase. For items of lesser value than the original purchase, a credit will be issued for the difference, or a refund can be given minus a 30% Restocking Fee of the original item. The credit will be valid for one year from the date of issue. For items of equal or greater value than the original purchase, the Restocking Fee will be waived. All returned items must pass a manufacturing inspection before an exchange can be processed, as we cannot accept returns of used bedding.White Lotus Home has the option to refuse any return or exchange. Can I return my White Lotus Home product? Unused bedding can be exchanged in its original condition within 30 days of purchase. A credit will be issued for the full purchase price, or a refund can be issued minus a 30% Restocking Fee of the original item. The credit will be valid for one year from the date of issue. All returned items must pass a manufacturing inspection before a refund or credit can be issued, as we cannot accept returns of used bedding. White Lotus Home has the option to refuse any return or exchange. How will the product reach you for a return or exchange? The customer is responsible for bringing, shipping and returning the item to White Lotus Home. If you'd like to begin a return or exchange, please visit our showroom, call (732) 828-2111 or email info@whitelotushome.com. You will need a copy of your original receipt to be eligible for a refund or exchange. How will I receive my refund or Store credit following a return, exchange, or cancellation? All refunds will be issued by the method they were received. For orders placed by credit card or PayPal, please allow 2-5 business days for funds to return to your account, as processing time may vary by financial institution. Orders paid by cash or check will receive a check sent via USPS. If you opt to receive a Store Credit for the full purchase price, a user-specific coupon code will be crafted for your use online, by phone, or in-store and sent to you via email. Please note that all store credits expire within one year from the date of issue and unless otherwise specified, cannot be combined with any other coupons or promotions. Only applies to White Lotus Home Mattresses. Not sure if a green mattress is right for you? Sleep on a White Lotus Home mattress for 120 nights. If you don't love it, send it back for a 30% restocking fee—shipping's on us. If your mattress has a physical defect, please contact us via phone or email within 120 days of your purchase. Send photos of the issue(s) as soon as possible so that we can figure out the best solution to your problem (i.e. replacement or repair). If you are 100% unhappy with the mattress(s) that we helped you decide to purchase (i.e. we made recommendations to you via phone or email), please contact us within 120 days of your purchase and present your concerns so that we can review your case and consider the next best steps to ensure your satisfaction. Not sure if a green mattress is right for you? Sleep on a White Lotus Home mattress for 120 nights. If you don't love it, return it, for a 30% re-stocking fee. If your product has a manufacturing defect, please contact us via phone or email within 120 days of your purchase. Send photos of the issue(s) as soon as possible so that we can figure out the best solution to your problem (i.e. replacement or repair). If you are 100% unhappy with the product(s) that we helped you decide to purchase (i.e. we made recommendations to you via phone or email), please contact us within 120 days of your purchase and present your concerns so that we can review your case and consider the next best steps to ensure your satisfaction. How will the mattress(es) reach White Lotus Home for a return or exchange? If you are within a 100 miles radius of our main location, in New Brunswick, NJ, we would be happy to arrange removal at no cost to you. If you are outside this radius, upon White Lotus Home's discretion, we would decide to either have the mattress picked up from you and discarded or we would kindly ask you to send us proof that you have disposed of it. Once the mattress has been removed and as per our printed warranty, we would then refund you the amount paid for your mattress less the 30% restocking fee as per our guarantee. If you'd like to begin a site inspection, return or exchange, please visit our showroom, call (732) 828-2111 or email info@whitelotushome.com. You will need a copy of your original receipt to be eligible for a refund or exchange. PLEASE NOTE: It is White Lotus Homes' own discretion, to pick up the mattress, send a third party to pick it up or ask you to kindly dispose of it. For legal and accounting purposes, we will request that you please send us pictures and a note stating and showing it has been discarded before we can process a refund or credit depending on the final decisions we agree upon. What are our customers saying about White Lotus Home? Our customers say many great things about us. We have been helping our customers save the Earth while they sleep since 1981, and we know this industry. Read what people are saying about White Lotus Home below, or check out the latest customer feedback on our White Lotus Home Facebook Pagehere. "I was so excited to win the giveaway last fall. My husband and I have been sleeping on our Green Cotton & Wool Boulder Dreamton Mattresses for several months now and love them! It feels so good to know that I can take deep, clean breaths all night long. We love their low profile and the handles on the sides. The wool wrapped around the outer layer helps regulate my husband's temperature. He used to always get so hot with other traditional mattresses. Sometimes I use the organic cotton topper as a padding in my hammock. It makes a soft, comforting place to relax and snuggle with my kids. Thank you White Lotus for making my home a healthier, more comfortable place to do life." This is in regards to ordering online. I had been scoping out a few online shops for a latex mattress, which is a difficult purchase to make as most show rooms do not have one for you to test-lie. White Lotus had a sale, which made the latex mattress a great deal! Time got away from me, though, and I missed the sale, but when I emailed customer service, Lauren was very nice and offered to extend the sale for me. I had to call to place my order, which wasn't a hassle at all. The sales rep I spoke with was friendly and helpful. It took 3 weeks for me to receive my mattress, as it is made to order. When it arrived, the packing slip indicated that it was something different than the latex mattress I had ordered. I was panicked. Sending back a 90 lb mattress was not ideal, and not to mention the thought of having to sleep on my old mattress another night made me want to cry. I called the next day and spoke with Lauren. She checked the specs of my delivery and told me that the weight of the mattress indicated that it was the correct item. She told me that sometimes the makers will check the box "dreamton" to indicate that the mattress has a wool and cotton covering, but that does not mean it is the dreamton futon mattress, which is what I feared. She asked me to send her a picture of it, as the dreamton futon mattress would look differently than the latex one, as it has buttons on it (I can't remember what they are called). I sent her the pictures and she verified the item was indeed the latex mattress I had ordered. What a relief! Now about the mattress itself, what a dream to sleep on! I had been waking up with aches and pains every single morning, having to take extra care just to get out of bed. I woke up the morning after the first night we slept on it, and I was nervous to move, not sure if my back would be hurting or not. Let me tell you, I have not had a single ache or pain since sleeping on this new bed. It is so comfortable! It is firm enough but yields to your weight and conforms to your body. I have slept like a dream since having this new mattress! Also the main reason we chose White Lotus is because the mattresses do not off-gas with nasty chemicals. I would definitely recommend this company and their products! Actually, I already have! Wanted to thank you for these fantastic pillows, barrier covers, and pillowcases ...and commend all of you on a job so well done! Everything is EXCEPTIONAL and amazingly well-made, every single seam, every zipper; I can hardly believe my eyes! Wanted to be sure you know that you guys are doing a fantastic job. You clearly have such high standards, it's awesome to see -- and to be on the receiving end. I'm beyond grateful to have the opportunity to purchase such high-quality, eco-friendly bedding products from kind people at a good-hearted company that's truly a cut above the rest. Put simply, your ethics and the beautiful items you create here in the USA are a rarity in this day and age. Really really thankful for White Lotus Home! Please extend my appreciation to all those who sewed so carefully and put together our order. You're making a lot of people (us and your other customers) very happy! The bed is so comfortable with the topper and the upgrade you gave us! Also the pillows are great! We appreciate it so much and will absolutely tell people! Thank you again for going above and beyond! Message: My romance with white lotus home began a few years ago when meeting Elizabeth at a trade show in New York. I had been looking for organic bed products and was given mini pillow sample. Later that year I went through cancer treatments and wanted to become more and more organic. I remembered Elizabeth and visited her at the store that, at the time, was in Florida. With her help and very much patience, I purchased an organic comforter and body pillow which were amazing. Upon moving back to New York I purchased the green cotton, latex wool Matress - which is amazing. I must say that during the time I was going through chemo and radiation I spent a lot of time researching different beds form different companies and eventually bought the mattresss form White Louts— The customer service is always amazing. People there treat you like family- seriously- try calling- you will see. I am so happy with my experience with everyone, especially Elizabeth and want to thank everyone so much !!!!!! Thank you so much for the true pillow!! It brings a touch of home to our hotel room. I look forward to using when we find a new home. Y'all are an awesome company. I plan on telling everyone that I know. Great company with very quick response to inquiries! I cannot stress enough how important it is to sleep without chemicals. I love my bed so much! I bought an organic bed because I was suffering from sleep apnea. I would stop breathing in the middle of the night and wake up violently! Going organic (mix of latex, wool, and organic cotton) has stopped my sleep issues completely. It even brings me deeper sleep and more complex dreams. In Burlington, VT we are lucky enough to have a retailer in town so I can try all the White Lotus Home Products. My favorites are the kapok pillows and the wool wrapped latex mattress. Kapok is so soft and silky! It's a very special tree that produces an amazing fiber. I am waiting for some new guest cots to arrive that will be going into a DIY pull out couch. So excited! We bought our futon from here. They make it to order, and it's all constructed in America. They stuffed the mattress with organic stuffing and provided a very solidly built frame. They also have a wide variety of mattress and pillow coverings. It costs a little extra, but good furniture is always worth it. since it lasts. We have two all green cotton twin mattresses for our children. I end up sleeping with our toddler at some point most night because she is still nursing. The mattresses are so comfortable and I feel good knowing my children aren't breathing in any harmful chemicals. They have a wonderful natural cotton aroma - my son's still does after nearly five years! His mattress is still in excellent shape with rotating it every couple months. I will go back to White Lotus again and again! We are saving up for a King mattress of our own. I LOVE LOVE LOVE my White Lotus Queen Dreamton, wool topper, wool pillows, buckwool pillows, and wool duvet! The Wool duvet is one of my favorite things in the world! I recently ordered and received the Green Cotton and Foam full size mattress without chemical flame retardent. We love it; very comfortable and great quality. We feel so much safer letting our toddler sleep on this mattress as opposed to a traditional mattress. Thanks White Lotus! Purchased two 100% Organic Buckwheat Pillows for our family last April '12. The pillow sizes were abundant. I like that the pillows have weight to them and can conform to your head's shape with ease. My 9 year old daughter loves her pillow and I feel confident knowing she is getting a good night's sleep. Recently we went on vacation and definitely missed our pillows. A big plus is that the pillow is environmentally organic and custom made per order. Knowing that our family is not breathing poly chemicals from typical foam pillows and sleeping soundly from organic pillows is important to our overall health and well being. I am very satisfied with the high quality products and service from White Lotus. Thanks!!! I purchased 10 lbs. of organic buckwheat hulls in order to complete my meditation pillow project. Not only did White Lotus Home offer the best price I've found online, but the deal was sweetened with a promo code saving me additional $! They arrived in a reasonable amount of time and the quality of the hulls is excellent. If you need buckwheat hulls this is the place to go. I definitely will order my bulk organic fill from them in the future. I ordered two Kapok pillows, medium stuffed. They were really full so I bought another small organic case for my little guy and ended up with three pillows for the price of two! They are light, soft and just as comfy as down...we all love them! I also ordered a wool pillow but even after airing it out for several days the smell was just too strong and I was unable to return it. Kapok is definitely the way to go! Thanks White Lotus. We bought a conventional bed from Sleepy's and the smell was so awful that I had the delivery people come back and get it. I have a sensitivity to chemicals and it caused an intense headache and made my eyes water. I slept on the couch for the next couple of nights while I figured out what to do next. I found White Lotus Home on the internet and the very next day drove down to their store in New Jersey. I was greeted by a very helpful and friendly salesperson who walked me through the whole experience. David and I love our organic mattress and our bed frame! We even bought a mattress topper, two pillows, and a duvet from White Lotus Home. Our bed is exceptionally comfortable, easy to care for and has improved our quality of sleep immensely. Our Queen size bed has handles on both sides for easy maneuvering. It is very important to both my husband and I that the bed frame was made locally. One of the legs of our bed did develop a small fracture and White Lotus Home sent us all new replacement legs! I will never go anywhere else for bedding again. I love my bed so much. Thank you White Lotus Home! I bought a White Lotus toddler mattress for my baby when she would not sleep in her crib. I initially used the mattress in her crib and she was SO much more comfortable. And it fit in the crib perfectly - snug but not too tight. Later on I moved it to the floor so she could get up by herself, and so that I could lay down with her. I lie down on it every night with her while she goes to sleep, and it is extremely comfortable to me. I would love to get more for the rest of the family, the only thing that keeps me from doing so is the cost, and not being able to see/try before I buy. I think chemicals are a huge problem in our society and love that we have options like this. I also prefer to support companies that manufacture their products in the USA, and supporting small business. I love that I was able to find a quality, made in the USA mattress without any nasty chemicals at White Lotus Home without having to spend a ton of money. Much of my home is outfitted with White Lotus home products, from my mattress, to my pillows, to my sheets, and my fold-up futon and frame. Everything I have ever bought from White Lotus is beautiful and very well made. In my opinion they offer the best sustainable bedding and home furnishings out there; where else can you get something 100% organic, and made here in the US? So many things on the market that are "sustainable" in fact often contain flame retardants and other chemicals, or are made abroad in low-wage conditions. White Lotus offers a vision and a set of products counter to this. I have been extremely pleased with White Lotus in the past, and intend to purchase more things from them in the future. I highly recommend them! Have their king size 100% organic cotton duvet, and it's the nicest duvet ever! Super soft, warm, and excellent quality. Matched with the 100% organic cotton pillows, it's hard to leave town and sleep anywhere else! I'm a White Lotus customer for life. First class service. We have bought at least 7 futons plus a bunch of furniture, pillows and bedding from WLH over the years. WLH has AWESOME customer service, beautiful, handmade products.... and you're taking care of yourself and the planet (and supporting a small business) in the process. Go on and shop there...you know you want to! Excellent customer service and wonderful non toxic products! Great concept that is fulfilled brilliantly. They have great prices on bedding that won't make you sick! Not just is you have allergies or sensitivities. This is beautiful luxurious bedding and items for your home. Wouldn't go anywhere else! As a mother of 2, you always think about the safety and health of your children. I started reading about all the toxic chemicals that are in baby crib mattresses and bedding. I then learned that there is a natural and chemical free option - natural bedding!!! So I then searched for a local retailer and came across White Lotus Home. I stopped by their showroom and was so pleasantly surprised at all the wonderful organic and natural products available for your entire home. I purchased an organic cotton and wool crib mattress for my boys plus beautiful organic cotton sheets. Couldn't be any happier with my purchases plus knowing that my children are safe from harmful chemicals --- I am one happy mommy!!! :) Thanks White Lotus Home! Love this place! Ever since I purchased my bedding from White Lotus Home I have notice a much more consistent night's sleep. Most importanly my husband is sleeping through the night without tossing and turning!! Staff is friendly and service is great. If you only go green for one thing, make it bedding! Thank you so much for the travel pillow, White Lotus Home! Love my chemical-free organic pillows! Absolutely LOVE our White Lotus Green Cotton mattress and topper, and Organic Cotton covers! Chemical-free and allergen-free for healthy and super comfy sleep! It made such a difference for us! We also love that they are handmade with much care in the USA, and they have the most thoughtful customer service! Highly recommend! Thank you so much again! I'm absolutely delighted with my new organic cotton duvet from White Lotus Home. I'm amazed that it holds in the heat better than my previous down one (I had to turn the setting on my bed warmer to a much lower setting! ), yet it also breathes better so that I never wake up sweaty. What a lovely piece of workmanship! This pillow is excellent. I ordered the queen size medium fill and it was almost perfect. I took out a bit of the kapok and it was absolutely perfect. The kapok is high-quality and easy to remove - other kapok pillows I've had have had flying kapoc pieces when I have tried to remove some, but this kapok held together easily and did not make a mess when I removed it. Also, the zipper is well thought out - it is about half the width of pillow and centered so you don't hear it when you move the pillow around at night time. If you have never tried a kapok pillow I highly recommend it because it is supportive and easy to adjust and it does not hold heat. I have tried other adjustable pillows made of woolly balls but they were lumpy when I removed some of the filling. This is a very nice high-quality pillow. I love it! I think it has actually affected my health for the better with this wonderful futon mattress. Also very comfortable. Maria phoned in answers. VERY happy customer! I recently received a package from my best friend back home and it's a pillow set from this store. It is 100% organic and it feels amazing! The quality is perfect and you can tell that a lot of labor and love is put into their product. I'm definitely ordering more items for my home from White Lotus. Thank you guys (and my BFF)! The Kapok pillow I ordered has really helped me enjoy a comfortable sleep. A great buy, thanks !! American made, American products... Natural, cotton, organic. products for very reasonable prices. The best sheets and pillows I've ever owned. Really, they're worth the cost to buy locally. This may be one of Brooklyn's best hidden gems. I've been searching a lot of different stores for a comfortable mattress. I was looking for an extra firm mattress and White Lotus was the first place I found that actually had a bed that truly ranged from soft to very firm and extra firm. I went back to the store 3 different times and spent probably 6+ hours just trying out their different mattresses and laying on them to get a good feel. Marlon never made me feel rushed and never pressured me. He answered all my questions and offered really good solutions to various different bedding products I was looking for to go along with my mattress. Marlon was so great about quoting us prices and he doesn't try to kill you with customization fees for an inch here and there the way most companies jack up the prices. We spoke to a couple of other reps too and everyone was very friendly and helpful. My husband and I ended up buying the popular boulder mattress with wool topper, their wool pillow and a custom cushion. White Lotus is one of those places where you get superior customer service, five-star products and you'll feel good to be able to support an honest local business. Extremely excited that they opened a store in Miami. I was able to shop on opening day and take advantage of their great specials. This company makes organic living affordable! Now all my bedrooms are organic. Everyone can sleep longer and healthier. Thank you White Lotus!! I'm so glad White Lotus Home is now in Brooklyn. I bought wool pillows, several decorative pillows, hand sewn sheets and a boulder mattress from the High Park, NJ store and have been very happy with the personal, high touch service. Knowing what's in my mattress and pillows and where it's made are reassuring. Buying a mattress is an investment and I love being able to go there and being taken through all the options without feeling pressured. I was impressed with the factory and that you can see your mattress being crafted. What a rarity. There's nothing quite like sleeping on a natural, handcrafted mattress! Made in America, no chemical fire retardants! I have a king Dreamton cotton and wool mattress from White Lotus home. I have had it for over a year now and it is still great. I love that it is chem free and made in America. I have ordered a number of other items directly through them, including their organic decorative pillows (which feel like thick marshmallows) and some stowaway futons and covers. The customer service is fabulous, custom orders are accepted, and their sales are great. YES! My 100% organic Queen Mattress has arrived and I'm beyond pleased smile emoticon Why, for 2 fundamental reasons; the supreme quality and the comfort, besides the fact its organic. My instincts were right, with plenty of mattress companies to pick from and doing my research this has been the best decision I could have made. I will be sleeping well, waking up fresh and rested which is pinnacle for my well-being and optimal mental function! Thank you White Lotus Home. Just wanted to say THANK YOU for the organic cotton pillow I won recently through a contest. I LOVE it! It's comfortable and non-toxic, what more could I ask for? Great pillow, great customer service, great company! ?#?whitelotushome? ?#?organicpillowgiveaway? ?#?organicbedding? I purchased a organic mattress and I am happy And wondering why I didn't buy this sooner. Great staff and very helpful. Delivery as scheduled ... I highly recommend !!! I never realized what a difference these mattresses make until I purchased one for my newborn. He sleeps so well on this mattress and the bedding are a perfect compliment. They help with his allergies and keeps him from having any episodes. I huge thank you to this company for making the life of a mommy easier!! Do not underestimate the importance of what you're sleeping on- you spend many hours every night breathing in whatever your pillows, mattresses and bedding is made of. Most commerical "sleepware" has added chemicals that are known to be toxic. If you have an infant or child (who spend much more time sleeping than we do) this is doubly important as their small bodies are still developing. This company is ethical and produces quality, safe products. Yes, it costs more, but when it comes to bedding, we get what we pay for. It's an investment in health and will last many years. Great company, great products. Constant sales going on and the staff is really helpful! They even have frequent free pillow giveaways, which is really nice! I've ordered pillows from this company before for myself, my partner and my daughter and we all have different needs for sleep support. It's really nice to know there is a quality company out there who still cares for their customers and believes in high quality products! Bedding is an often overlooked source of toxins in our home. The chemicals in mattresses have been linked to SIDS. There are so many environmental toxins that we cannot avoid, it is very wise to avoid them where we can. We spend a third of our life in bed! White Lotus is a reputable company that creates quality products that are environmentally sound. Highly recommend. I love my cotton wool mattress! It's the most comfortable mattress I've ever slept on, and I don't wake up asthmatic every day like I did from conventional mattresses. If you care about what you are sleeping on, look to White Lotus. We have 2 wool pillows and have a bed comping our way in the next few weeks. Natural or organic, toxic free is the way to go for your whole family and White Lotus has it all. Handmade American way! I bought two mattresses from White Lotus during their July 4th sale and ended up paying less than what I would have for chemical-laden conventional mattresses. The staff was courteous and informative both times that I called (and very understanding when I asked to delay shipment for a week until my next payday). I am passionate about subjecting my daughter, my husband, and myself to as few dangerous chemicals on a daily basis as possible, but on my very tight budget I never dreamed that I would be able to afford all natural mattresses for my family. Their sale, along with their policy of letting you pay in two separate installments, made it possible. I got two of the wool/cotton blend mattresses and I have to say, I honestly could not be happier! I was a little worried because I have always preferred cushy, pillowtop-type mattresses, but I have slept even better on my new mattress. It's firm but very comfortable-- my husband (who was a little skeptical) is totally sold! I even overheard him recommending the mattresses to his father who has back problems :) I have to say though, that in addition to my happiness with their products, I was really impressed with the company's compassion and charity after Hurricane Sandy. They really are people who are concerned about people, not just a business. I will definitely be ordering more items from White Lotus in the future. Shop local, organic, and eco-friendly! I was looking for an eco-friendly, organic pillow and I found it at White Lotus Home. I bought a Medium Standard Kapok pillow. I had it customized with a zipper so that I can remove/add fibers to suit my needs. I've been sleeping on it for a few weeks now and I love it! I haven't had neck pain at all and I've had pleasant dreams. The sales associate, Elizabeth (I think) was really nice and helpful. 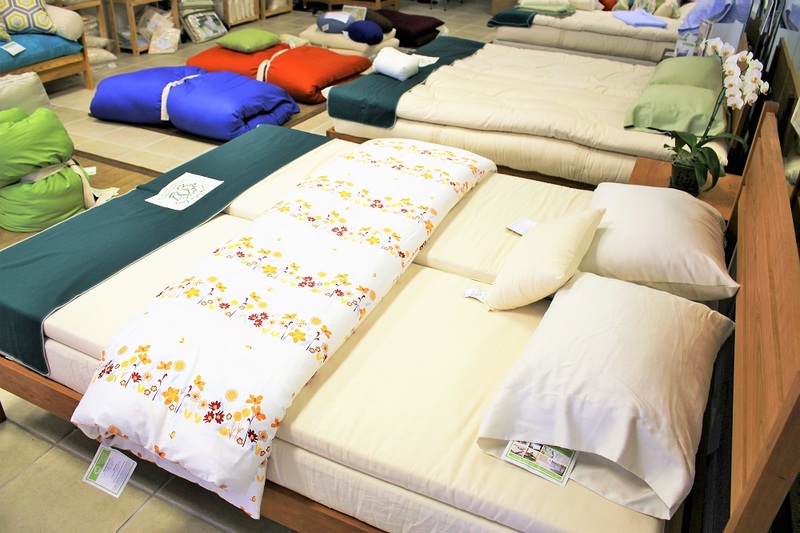 They sell eco-friendly mattresses, sheets, bed frames, nightstands, pillows, blankets, and throw pillows. They do all their sewing on premise; mostly handmade stuff! When I'm ready for a new mattress, I will definitely consider purchasing a mattress/bed from here! Excellent quality chemical-free bedding. I have purchased multiple futons, pillows and duvets over the years from White Lotus and been extremely pleased with every item. They have made minor errors on orders but have also always been eager to correct them which tells me their customer service is a high priority for them. Smart business. The one 'con' I would mention is that it does seem to consistently take a long time for orders to be completed, but I know this is because of how much attention to detail and quality they put into every order, so I am willing to be patient. Their products are definitely worth the wait. "Just wanted to let you know that we received the replacement Standard pillow yesterday in fine shape, and immediately sent the original one back via UPS store yesterday afternoon. We were so pleased and impressed with your service and your product. We are already sleeping better. Rest be asssured we will be passing your name on to many others. 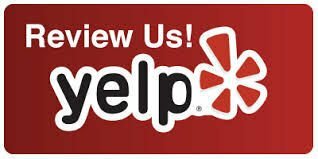 Thanks so much again for the great service." "I just wanted to pass on that I discovered that the name of the salesman I had spoken with several weeks ago about the White Lotus mattresses is named Fred. Fred was very patient and answered all of my questions. All that I knew was that I had to get rid of my memory foam mattress, but I didn't have any idea what to replace it with. Fred was so enthusiastic about White Lotus mattresses and was able to provide such a wealth of information that with his expert assistance, we were able to narrow the choices to one (White Lotus offers so many different possibilities!). Not only that, but the sales price he gave me (which is on the site, but I hadn't gotten that far on my own) was so much less than our outgassing tempurpedic that if your store had been nearby, I would have gone to your store and purchased the mattress right after our conversation. No kidding. Please give my kudos to Fred and your management for superior customer service." "We just received our mattress. What a surprise since we thought it was going to take 2-3 weeks! It's awesome and our son loves it. He won't get up! Thanks so much for a safe, quality product and a speedy delivery!" I would like to thank you for taking care of my order so efficiently. I did not have the opportunity to elaborate on why I chose to order from your company. I've tried for months to find a Canadian supplier of organic bedding and mattresses, as I was hoping to buy as local as possible. Unfortunately the websites I came across didn't offer the reasonable prices that White Lotus does. Also, upon searching the U.S. market, White Lotus was the only company I came across that would ship products to destinations outside of the U.S. So, thanks again for being so accommodating, and making the ordering process a breeze." to let me know if you can customize a portacrib mattress for us and pricing. I believe the measurements are roughly 24x38x2." "I just wanted to thank every one at whitelotus, for making our shopping and futon purchase feel like we were part of your family. The total experience was wonderful. We purchased a futon back in August of this year, and loving every minute of it. The fact that it is made in the USA, and HAND crafted in your store with 100 % cotton, gives me a good feeling. Hugs and kisses to everyone at Whitelotus." "I just wanted to say the custom made kapok pillows are great!" "Prentiss (our client) will be very happy about the quality of the cover and how they feel. Thanks for your great service." I am attaching some pics of the cushions you made. They are great. The bench cushion fits the bench perfectly, and the knee cushions make it possible for me to sit for lengthy periods without making my knees sore. Thanks again." "i just had to write to tell you how amazing my futon and wool topper are! i feel like i've wasted my whole life sleeping on awful beds. thanks so much. i'm recommending white lotus to everyone." Thank you for keeping us in the loop! We bought a single futon for our son about four years ago and it remains the most comfortable bed in the house. Everyone sneaks in there for naps. We also have two toppers (wool and cotton, I think). One rests atop our elder son's old "standard issue" futon, which has grown hard and lumpy. The topper puts some comfort back in his sleep. The other topper is used as a sort of roll-out floor mattress for when guests stay the night. We're thrilled with the quality and love that we're supporting your wonderful mission with our purchases. We have a modest income but are saving our pennies for new White Lotus mattresses for ourselves and our elder son and would love a hide-a-bed too some day. Thanks for doing what you do. Keep up the good work." "I bought a mattress-topper from you guys, and a frame from norka, a year ago and I love, love, love it so much! The significant other was not pleased when I told him what I had bought but he does not complain anymore....well...except about the fact that he has a terrible time getting out of bed in the morning :) Our whole family loves it so much that we are going to have to upgrade to a bigger one seeing as how the 2 dogs and one of the cats REFUSE to not sleep there....even though NONE of them used to sleep with us. Anyways I love the new website design it is a lot prettier than the old one and will show off the great products you guys sell. Compared to every other place we looked you guys had the best prices and everything was handmade. I love it :)"
"I got my futon today and I absolutely love it! I can tell this will be the best sleeping experience ever. Thanks for the high quality and workmanship. It really shows." "I just wanted to let you guys know how happy we are with our all cotton mattress and wool topper!!! We've had our new bed for about 6 months now and can't believe how comfortable it is. I did my undergrad. work in New Jersey, at Drew, and heard about your futons at that time; when we moved to Denver and bought our first house, decided it was time to splurge on a new mattress etc.. We couldn't be happier. Even our dog Mabel prefers to sleep on the bed over the futon in the living room. :) Thanks for the great nights of sleep!!" "I just wanted to let you know that our mattress came today and my daughter loves it. I was expecting it in 2 to 3 weeks, not 2 days! Thanks so much! I look forward to shopping with you again. I'll be sure to tell anyone who will listen how great your products are(my youngest has an all cotton toddler mattress already)and about the wonderful service." Thank you so much for donating a natural made pillow for my son. When my son was diagnosed with childhood cancer I decide to surround my son with nothing but natural surrounding. My 6 year old son loves your pillow so much that he looks forward to bedtime!" Does White Lotus Home offer Private Label Manufacturing? Private Label: Brand Equity We build it. You brand and sell it. Have a great natural bedding idea? Need custom-shaped pillows? Want to extend your product line to branded, high-quality natural and chemical-free goods without the hassle of investing in a new manufacturing operation? White Lotus Home’s Private Label Manufacturing can affordably turn your vision into reality. We offer turnkey solutions to manufacture handcrafted goods that deploy your company’s existing brand platform – packaging, color pallet, and image. Our talented design team can bring your special project to life. What are the benefits of Private Label Manufacturing? It’s smart. 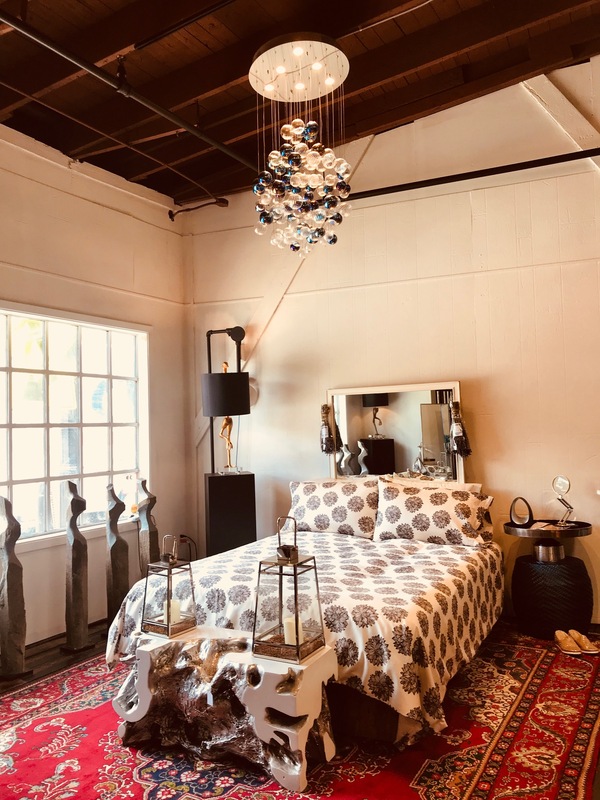 White Lotus Home will manufacture products to your specifications, with the confidence they’re made in the USA by hand out of finest natural fibers and fabrics. It’s branded. Your designs are credited on the Law Label, using White Lotus Home’s registration number (see the example on this page). That means the product is made specifically for your company and your customers. And turnaround time is fast! TO APPLY: Review and complete the Wholesale/Private Label Application and, to custom design your product, the New Product Development Form. Minimum initial order of 100 pieces of at least one product. Private Label Manufacturing extends your brand. It’s a sweet Dream come true! White Lotus Home takes pride in its detailed customer service. We work closely with our Private Label clients every step of the way – from start to finish – to turn your vision into reality. White Lotus Home, founded in 1981, has a team of skilled artisans in our New Brunswick, NJ, plant who create high-quality natural and non-toxic products by hand for furniture outlets, bedding store, massage schools, spas, hotels, nightclubs and natural products stores. We also handcraft items for the White Lotus Home showroom in New Brunswick, New Jersey, and nearly 100 online and brick and mortar stores around the USA and Canada. We provide jobs to our neighbors, help to protect the environment as well as support local farmers. Below are examples of products we’ve handcrafted for a few of our Private Label partners: Mighty Twenty, Little One’s Pillows, Rawganique, and more! These companies and their end products demonstrate our commitment and dedication to quality. We promise to exceed your expectations. We promise to make your wildest, Greenest, ideas come true! Adding non-toxic and natural bedding to your product line is good business. Consumer Mattress Reports, a bedding industry magazine, said the fastest growing segment of the mattress industry is specialty beds at the expense of traditional box springs. The magazine projects strong sales over the next two years of green options. According to the Organic Trade Association, “sales of organic food and non-food products in the United States broke through another record in 2014, totaling $39.1 billion, up 11.3 percent from the previous year. Sales of organic non-food products – accounting for 8 percent of the total organic market – posted the biggest percentage gain in six years, with sales of organic fiber and organic personal care products the stand-out categories”. What’s more, American-made products are in vogue. Over 60% of Americans prefer to buy “American-made clothes and appliances even if those cost 10 percent more than imported versions; more than 25 percent said they’d pay at least an extra 20 percent,” according to Consumer Reports. White Lotus Home Private Label Manufacture can fast-track your entry into this marketplace. White Lotus Home has a strong history of private label partnerships for a wide range of clients --- below are a few examples. White Lotus Home handcrafts all of Billow Global kapok and wool pillows plus all of the Heart pillows. White Lotus Home worked with this client to create this wonderful Side Sleeping pillow! Available online and on ETSY! 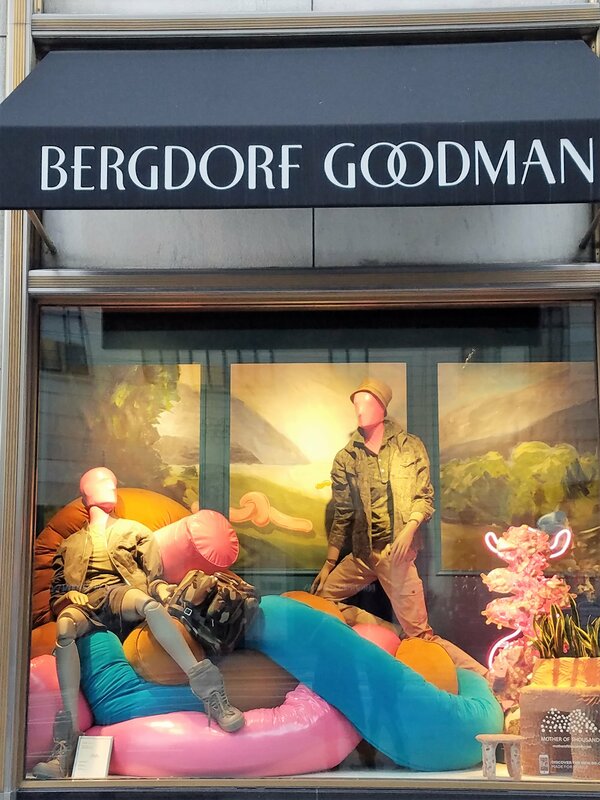 White Lotus Home handcrafted 40 foot, 20 foot, 13 foot Kapok filled noodle pillows for Molly Findlay and they were displayed at Bergdorf Goodman. White Lotus Home meticulously handcrafts each and every pillow. We cut and sewed this wonderful fabric designed and created by Mighty Twenty. Every pocket was individually sewed by hand and filled with natural Kapok fiber. White Lotus Home handcrafts the inserts and covers for OmSweetOm Organics in two sizes. The round meditation insert is made with an organic cotton casing and filled with Kapok. The fabric for the covers selected by OmSweetOm Organics is Certified Organic. Little One's Pillow, which is sold on Amazon, are hand-made with pillowcases of an certified organic cotton sateen fabric. We create non toxic Mattresses, Pillows and Bedding products for Rawganique. White Lotus Home created a variety of covers for the outdoor space of The Output Club in Brooklyn, NY. Not only does White Lotus Home hand deliver, we also installed. White Lotus Home supplied The Box Hotel with handmade decorative pillows. The pillows were filled with Kapok encased in an certified organic twill fabric. The beautiful grey and orange covers were hand-selected by the BOX Hotel. To learn more, call sales at 732-828-2111 to discuss your needs. Also take a moment to complete the Wholesale/Private Label Application and, to custom design your product, the New Product Development Form. Minimum initial order of 100 pieces of at least one product. We manufacture children’s accessories, specialty pillows, duvets, mattresses, and custom cushions. Does White Lotus Home offer a Wholesale or Dropship Program? Wholesale & Drop Ship Start your own Online or Brick and Mortar Bedding Store! Work from home and help save the Earth! Wholesale clients receive 50% for all items shipping to their showroom. Need an order sent directly to your client? We offer Drop-Shipping for 30% off MSRP. All prices include FREE shipping in the Contiguous US. NOTE: You must already have an Ecommerce website or brick & mortar store established before applying. Amazon stores, as well as other online drop-shipping services, will be considered as well. 1.) A link to your website. If your website is currently under construction, we require template screenshots or a link to the beta version of your website. 2.) A resale certificate number. You are exempt if your state does not require one. 3.) Your complete credit card billing information. Once we receive your application, we will be back in touch within 7-10 business days with a decision or feedback. The bedding industry is over $100 Billion and the Natural Bedding industry is merely responsible for 1% of that, so we have a lot of room for growth! White Lotus Home of NJ has been supplying massage schools, spas, furniture and natural goods stores as well as individual customers with natural, high-quality bedding products since 1981. Many of our products are available for purchase at Boulder Mountain Futon, in Boulder, Colorado; Hardwood Artisans of Woodbridge, Virginia; Bliss Sleep Center in Water Mill, NY, and many other retailers in over 20 different states and Canada. Throughout the years, White Lotus Home has always had a simple two-fold objective: (1) to offer products that are non-threatening to the planet and its people and (2) to educate consumers about the benefits of natural bedding. White Lotus Home handcrafts quality products designed to last for many years. In doing so, we cut down on the waste created by temporary bedding solutions and give our customers the peace of mind that comes with buying a 100% recyclable and natural product. As a Green America and Organic Trade Association member, we believe we can make a difference by setting an example for others. Since our mattresses, pillows and bedding are made with pure, natural ingredients, White Lotus Home provides more than a good night’s rest; we provide peace of mind for the Earth-conscious consumer. We are open to exploring other options that may help you with your initial order. White Lotus Home prides itself on the custom and private label work that we offer, as well as wholesale incentives when purchased in bulk. Our website may already have many of the answers to your questions and we encourage you to write us at sales@whitelotushome.com with any more questions you may have. If you would like to open your own White Lotus Home store, please send your request to marlon@whitelotushome.com. Thank you for your interest and helping us continue to save the Earth while we sleep! Want to learn more about our Private Label Program? Review our info on this page or our brochure. All of the following stores carry White Lotus Home handmade products. You can shop online, right on this site or at any of the stores below! White Lotus Home bedding products are available all over the USA. White Lotus Home has a large store and handcrafting facility in New Brunswick, NJ which is only 35 minutes from New York City and 45 minutes from Philadelphia. If you would like to see a White Lotus Home dealer in your city, send a request to marlon@whitelotushome.com. If your local bedding store does not carry the item you are looking for, you can make a direct request to sales@whitelotushome.com, tell what you are looking to sample and we will try and help you. Please note, retailers keep variable levels of stock. We recommend, contacting your local bedding retailer first, to make sure they have the White Lotus Home item you are looking for. If they do not, they are able to make that request to us or contact us at 732-828-2111 or info@whitelotushome.com and we will assist you further. Carries White Lotus Home Buckwool and Kapok pillows. Carries White Lotus Home firm style cotton mattresses like the boulder in cotton and Dreamton. Carries White Lotus Home mattresses, pillows and bedding. Carries our futon mattresses and others, plus pillows. Carries White Lotus Home children items. 7,000 square feet of handcrafting and showroom space where you can experience all of White Lotus Home Natural products. Showroom hours: Tuesday - Saturday 10 AM - 6 PM Sunday & Monday by Private Appt. Only. To make an appointment, to visit this store at other times, please call or contact info@whitelotushome.com. Driving: 35 minutes from NYC. Take NJ Turnpike to exit 9, Continue on NJ-18 N. Take US-1 S to Joyce Kilmer Ave in New Brunswick. Train: take the NJ Transit NE Corridor at Penn Station in NYC, going to New Brunswick, NJ. Brooklyn Factory Showroom, currently hosting Art by Tina Psoinos and jewelry for furniture by Lisa Jarvis. T 718 567 0777. Call this number also for shipping quotes outside the Tri-state area. Monday - Saturday 9 am to 5 pm. Carries White Lotus Home Mattress, bedding, and pillows. Please call first, to make sure they have what you want on the floor! Please call to arrange your visit: 631-885-0075. Carries White Lotus Home pillows. Carries White Lotus Home natural mattresses. Carries White Lotus Home natural mattresses. Carries White Lotus Home bedding and mattresses. Would you like to be listed as one of our natural bedding products dealers? We have many inquiries for White Lotus Home products in all major metropolitan areas. White Lotus Home offers easy ways for online Drop-ship dealers and/or Brick & Mortar stores, to sell our products. Please visit our Wholesale page for more details.